Yahoo launches the much anticipated Yahoo Buzz tonight – a Digg-like site that takes stories from pre-approved news publishers (100 to start) and let’s users vote on stories and push them up to the top of the page. To see it in action, click on the buzz button at the end of this, or any, of our posts (update: button functionality won’t be live until Tuesday). Like Digg, the more users that vote for a story, via the embedded button or on the Buzz site, the higher the story goes on Buzz. But user voting isn’t the only factor in how well stories do. Yahoo is also looking at their search engine logs in real time to determine hot or breaking news. Stories on that topic will get an extra boost in the rankings. But there’s another part of Buzz that will get publishers excited – every day a few of the most popular stories will also be featured on the Yahoo home page. Yahoo has been experimenting with linking to third party news directly from their home page since last year. In one case, the Buzz team told me, 2 million visitors were sent to Wired for a linked article in the two hours it was on the Yahoo home page. 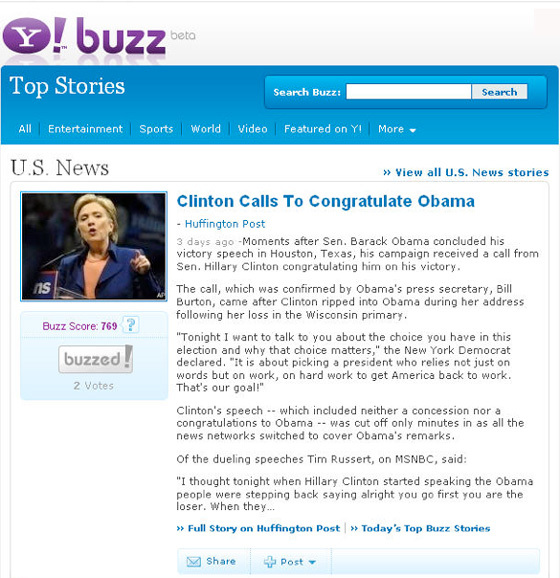 2-3 stories from Buzz will go on the Yahoo home page daily. 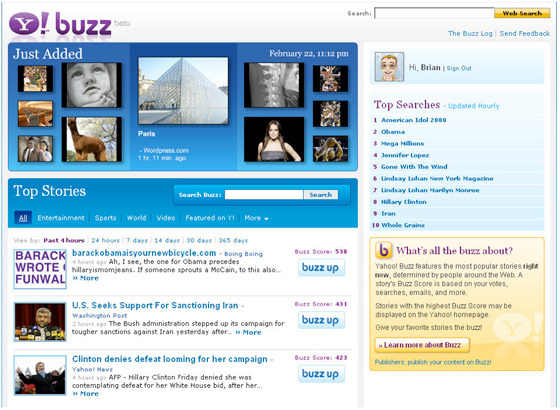 Buzz has categories including entertainment, world news, U.S. news, sports, business, health, and travel. Images and video are also separate categories. Of course, many publishers won’t be able to handle that kind of traffic flow. But Yahoo is also prepared for that. Smaller sites will only be linked on a fraction of the total home page views – in effect, Yahoo is turning down the firehose for those that can’t handle it. Yahoo isn’t the first large company to try out the Digg model. In mid 2006 AOL relaunched the Netscape portal as a Digg-like site. AOL eventually moved the service to a different domain name and renamed it Propeller. The service has about 3.8 million monthly unique visitors (Comscore), compared to about 12.5 million for Digg.